The most affordable headphone is here! Detachable headphone cable. 1xHD668 Headphone. 1x Pouch for Headphone carry. Entry level studio quality headphones. Light weight. // NEED TO PRICE MATCH?. Model: HD668. WHAT'S INCLUDED Headphones. ANY UNLISTED ACCESSORIES. WHAT'SNOT INCLUDED 3M Cable. Carrying Puch. The most affordable headphone is here! 1x HD-681EVO Headphone. Driver Type: Dynamic. 1x HD-681EVO User Manual. The black HD-681EVO headphones carry the premium-quality audio components with a slender, ergonomic design. Superlux’s HD672 headphones are lightweight, cool and durable. The overall sound is quite neutral over an extended frequency response with tight bass, well placed mids and highs that are clear and detailed. Superlux HD-672 headphone reproduces natural, spatial and accurate sound for all types of music. Superlux HD-672 features a balanced, contoured and bass enhanced full range frequency response with authentic mid-range and high frequency reproduction. Superlux HD 668B in open box condition, bought new installed cosmos pads and never used. Superlux HD-671 Closed-Back Over-ear Headphone. TheSuperlux HD671 is a closed-back dynamic over-ear headphone equipped with 50mm precision composite transducers. It’s balanced frequency response, high sensitivity and low impedance provide exceptional sound quality with clarity and detail. Superlux HD-671 headphone reproduces natural, spatial and accurate sound for all types of music. Superlux HD-671 features a balanced, contoured and bass enhanced full range frequency response with authentic mid-range and high frequency reproduction. Self adjusting headband with Flexi-durable design. Single sided stright cable. Low Prices. Reasons To Buy From Us. The HD681 headphones feature a semi-open design intended for use in professional monitoring applications. These headphones feature premium quality audio components paired with an ergonomic design. The self-adjusting headband provides the listener with a great fit and these durable headphones can even be twisted for use in single ear monitoring. Superlux Wired Dynamic Semi-Open DJ Studio Headphones * The Superlux headphones are impressive and are recommended for audio pros and music lovers. * Comes well-built with a great look * Its full-size around-the-ear earpad is very comfortable to wear. * Super bass sound, perfect audio experience for you * Large-aperture 50mm dome drivers deliver high precision sound. * Comes equipped with an adjustable and comfortable headband, Feel no pressure while wearing them. * Suitable for use with iPod, MP3 players, MP4 Players, Cell Phones and other equipment. 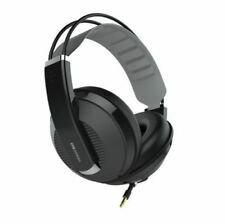 ​​​​​​​ SPECIFICATIONS: Brand: Superlux ​​​​​​​Functions: Noise Cancelling Connectivity: Wired Plug Type: 3. Superlux Studio Headphones. Open Back DJ Wired Over Ear Dynamic Earphones. Still Works. Both cables can be connected together for even more distance if desired. MPN HD668B. Superlux HD-668B Professional Semi-Open Studio Headphones. Silvery, clear cymbals. Flash & Lighting. Educational DVDs, Tapes and Books once opened. Superlux HD-660 HiFi Stereo Headphones With Enhanced Bass. The sound bass drivers are 9mm- 10mm. more information soon. These are used headphones With headphones, satchel, replaceable plug cable at both ends to and from device, and new never used opened ear protector. Silvery, clear cymbals. Exceedingly authentic voice reproduction. Balanced, contoured, and deep bass. These headphones from Superlux are designed for studio monitoring, but are equally suitable for general listening. They feature custom designed 56 Ohm drivers and comfortable, over-sized ear cushions. When wearing this high performance headphone, user shall realize this quality headphone is designed for reproducing large transient faithfully, that makes it capable of producing high sound pressure level contineously, and this is harmful to the user. Superlux HD-661 Monitoring Headphones. Superlux HD-661 professional monitoring headphones with excellent sound, perfect for live performance monitoring. Adjustable Headband. Adjustable headband. Cutting edge in the world of headphones. Professional monitoring headphones. - High noise attenuation. - Function: Noise Cancelling. - Natural and well-balanced sound profile. Main Features - Color: Black. Usually it cost about 35USD-50USD. Driver unit: 50 mm dynamic type / neodymium · magnet adoption. Cable: Straight cable detachable from headphones, 2 types of 1 m and 3 m included, Connector: 3.5 mm φ gold plated stereo mini plug. Maximum input: 200 mW, Impedance: 32 Ω, Head band pressure: 7.5 N.
Superlux HD381F Earphones Wired In-ear Monitor Earphone For Mobile Music / MP3 Package includes: 1 x Superlux HD381F 3.5mm In-ear Headset 1 x Winder 1 x Extended Cable 2 x Medium Earbud Tips 2 x Large Earbud Tips Shipping ---This item aill be shipped with a tracking number. ---Please note - taxes / other import duties are on buyer's responsibility. Superlux HD381F in-ear earphones features a balanced response, suitable for most kinds of music. It delivers a sweet vocal sound, as if the singer was standing right in front of you. It is Comfortable for wearing SPECIFICATIONS: Brand SuperluxModel HD381FWearing type In-EarFunctions Noise CancellingConnectivity WiredApplications Mobile phone, Computer, Sport, Portable Media PlayerPlug Type 3.5mm,L-BendCable Length (m) 1. Superlux HD681 Headphone Cable Monitoring DJ Studio HD Noise Isolated Headphones Meeting top audio detail resolution power, durably well-built and sweet-looking to boot, the Superlux headphones are impressive stuff and recommended for audio pros, music-loving collegians and starter audiophiles! Its full-size around-the-ear earpad coverage, adjustable looping headband structure and semi-sealed earcup design, bring your the comfortable wearing. 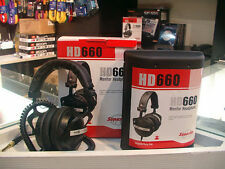 Superlux HD668B Professional Semi-open Dynamic Studio HiFi HD Detachable Headphones Package includes: 1 x Superlux HD668B Studio Standard Headphone 1 x 1m Cable 1 x 3m Cable 1 x 6.5mm Interface Connector 1 x Cable Clamp 1 x Storage Bag Shipping ---This item will be shipped with a tracking number. ---Please note tax / import duties are on buyer's responsibility. Specially design for studio with high fidelity sound and more music detail, provides a clearer sound for the sound engineer to make post-production. 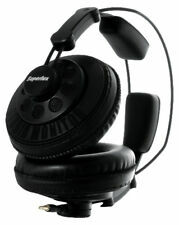 Superlux Wired Dynamic Semi-Open DJ Studio Headphones. 1 x Superlux Headphones. Connectivity : Wired. Driver Type: Dynamic. Product size (L x W x H) Product weight : 0.276 kg. Cable Style: Straight Left-Side. 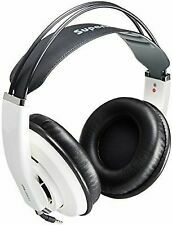 Superlux HD651 Circumaural Closed-Back Headphones GREY. The HD651 series of headphones are a fantastic set of fully enclosed headphones. These headphones present rich and accurate bass and excellent vocal sound for music lovers and artists everywhere. Superlux HD668B Professional Semi-open Dynamic Studio HiFi HD Headphones Specially designed for use in a studio with high fidelity sound and more music detail which provides a clearer sound for the sound engineer to make post-production. If you are a pursuit of excellent music experience, you really should get one! MAIN FEATURES: * Semi-open dynamic design, 50mm driver unit, gives you more detailed sound * Patent durable earmuffs, very comfortable for wearing even after a long time * One side detachable cable * Comes with 1m and 3m cable meets different needs for personal music appreciation or professional recording. * Gold-plated 3. The HD381 is a Booming Bass stereo In-Ear headphones for the Music fancier. In addition, we are the distributor of YAMAHA, Pearl River, San Carlo, Casio, Roland, Fender, ZOOM, Dun Huang, etc. SD card not included. Includes USB adapter cable. Supports micro SD card up to 16 GB. • Battery life (full) 6 hours. • Power (peak): 40mA. • External power cable: USB 5V 350mA. • Channel separation: 30db at 1KHz S.P.L. The sound quality of the HD668B is a semi-open type dynamic headphone that also responds to professional recording studio. I think that sound quality of balanced high definition HD668B can be used enough for professional users. Hope to have an opportunity to serve you. •eCheck will be held until cleared. Superlux HD651 Circumaural Closed-Back Headphones BLACK. The HD651 series of headphones are a fantastic set of fully enclosed headphones. These headphones present rich and accurate bass and excellent vocal sound for music lovers and artists everywhere. These cables can be connected together for even more distance if desired. Cable clip secures detachable cable from pulling out by incident. Shorter cable for smaller pocket devices. For various head size. Driver unit: 50mm dynamic type / neodymium magnet adoption. cable: detachable from the headphones straight cable, 1m and 3m two accessories, connectors: 3.5mmφ gold-plated stereo mini plug. Japan Usage Item. Professional Monitor Headphone HD681 Semi-Open type. Driver unit: 50 mm Dynamic type / neodymium ?. 100% genuine Item. The arrival of the item is 2-4 Weeks on average. Maximum input: 300 mW. Superlux HD651 Circumaural Closed-Back Headphones RED. The HD651 series of headphones are a fantastic set of fully enclosed headphones. These headphones present rich and accurate bass and excellent vocal sound for music lovers and artists everywhere. ・ Driver unit: 50 mm dynamic type / neodymium ・ magnet. Type:Dynamic, semi-open, circumaural. We only carry authentic products. Defective only. RMA# is required prior to sending the item back. Frequency Response: 10 - 30,000 Hz. Weight: 355 g (12.5 oz. ).